The 2017 Dodge Ram Promaster 2500 is a commercial cargo van that offers numerous configurations, impressive towing and hauling capabilities, and impressive interior comfort. Up front, you’ll find high-tech infotainment gear, so you can stay connected throughout your workday. The Promaster’s upfitting options help you organize and secure your cargo items. When you choose diesel power, you’ll enjoy impressive towing utility. The 2017 Dodge Ram Promaster 2500 offers a wide range of business solutions. To start, you can choose between two wheelbases – 136 and 159 inches – for the cargo space you require. 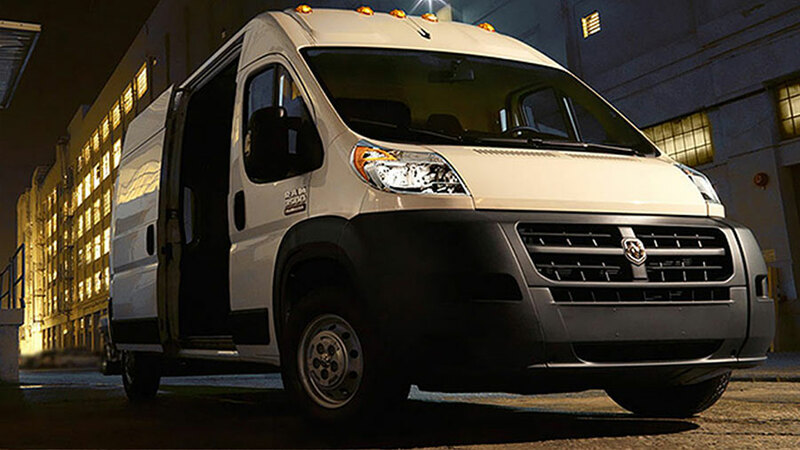 With the larger wheelbase, the Ram Promaster 2500 provides 456 cubic feet of cargo space. No matter which wheelbase you prefer, the Promaster 2500 comes with the high roof, maximizing your hauling capabilities. 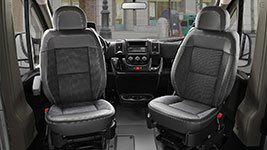 Up front, driver and passenger enjoy plush, supportive seating. Conveniences, like power-folding, heated side-view mirrors, save plenty of time in the long run. Luxuries – including heated seats and a leather-wrapped steering wheel – set the Ram Promaster apart from other commercial vans. The Ram Promaster 2500 is also big on modern tech features. 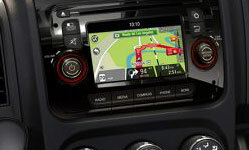 Dodge’s Uconnect infotainment system keeps you connected on the go. Use the system’s voice-control technology to access the system without looking away from traffic. Its excellent smartphone integration features give you the power to make hands-free calls and stream your favorite podcasts. Use GPS navigation to make deliveries in a timely fashion. Use the Ram Promaster’s USB ports to keep devices charged on the go. The mobile Wi-Fi hotspot comes in handy when you need to send a few work emails. You can also count on the Ram Promaster’s safety features. A variety of airbags, including front and side curtain airbags, protect passengers during a collision. Use the antilock disc brakes to make strong stops, even from high speeds. Hill start assist keeps the Ram Promaster from rolling backwards at stops. Stability and traction control add a layer of driver authority when road conditions are less than ideal. Under the hood, the Ram Promaster 2500 generates serious power for impressive towing and hauling performance. The 3.6-liter V6 produces 280 horsepower and 260 pound-feet of torque for a swift, smooth ride. Properly equipped, the Promaster 2500 tows up to 5,100 pounds. It hauls maximum payloads of 4,120 pounds. 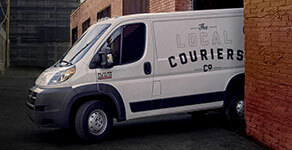 Unlike competitors, the Ram Promaster offers front-wheel drive, which makes it easy to handle in a tight spot. It also enhances performance in low-traction settings, thereby optimizing driver control. The Ram Promaster provides a 36-foot turning diameter to help you out of a tight spot. Up front, driver and passenger enjoy long-term comfort and support. Stay connected throughout your workday with smartphone integration and more. It’s easy to install custom shelving for your organizational needs. When you require substantial cargo space and a maneuverable ride, put the 2017 Ram Promaster 2500 at the top of your wish list. This commercial cargo van delivers world-class towing and hauling power to meet your business needs. Choose from a variety of body configurations for the cargo space you require. The Ram Promaster’s front-wheel-drive performance makes it a great option for around-town driving. Inside, driver and passenger enjoy modern comfort and infotainment features. Feel the power of the Promaster 2500 on a test drive today!